Arctic Oil and Natural Gas Provinces Map: The United States Geological Survey estimates that over 87% of the Arctic’s oil and natural gas resource (about 360 billion barrels oil equivalent) is located in seven Arctic basin provinces: Amerasia Basin, Arctic Alaska Basin, East Barents Basin, East Greenland Basin, West Greenland East Canada Basin, East Greenland Rift Basin, West Siberian Basin and the Yenisey-Khatang Basin. 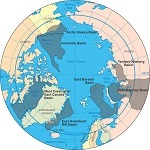 Map by Geology.com and MapResources. Even though he was told to walk straight in with the information, General Frederick Custer of the Canadian Armed forces felt etiquette was always the order of the day when entering a superior officers’ office. And this was as superior as they come for it was the temporary office of Sebastien Arnault, The commander in Chief of the Canadian Armed Forces. “Yes sir, I have it here.” Frederick hands him the printed email from his Greenland equivalent. Greenland’s delegate, Kiista Berthelson was frustrated beyond belief. She couldn’t believe the way this treaty negotiation was going. Russia had invaded their country three weeks before and they had not received any help at all. The UN called this meeting to negotiate the hostilities being carried out across the region but also to ensure the withdrawal of Russia from Greenland. However, Russia were not intending to withdraw and were playing up to the fact that Canada, the US and their allies would not come to help Greenland. The Canadian delegate, Samuel Sweeney and the US Delegate, Carter Kain had been watching the Russian delegate, Andrei Medvedev and his complete confidence that his country would be able to hold onto their piece of Greenland for the sake of avoiding a conflict that would quickly go global. Again, Boris replied immediately “Affirmative. We have all the proof you need. We have left contact instructions at your hotel under your aid’s name Roy Lundgren. He is already aware of the situation and has instructions to bring his mail to your hotel room. That is all for now. Please find a bin, turn off the phone and place inside. After 10 seconds a device will go off inside the phone, destroying it internally without causing fire or damage to the outer phone. Thank you very much for your time and I look forward to meeting you later.” and with that, he was gone.